By reading the Unizin pitch for the State University System of Florida shared yesterday, we can see quite a few claims about the (potential) benefits to be provided by the consortium. "Make sure that the universities were not cut out of [distance ed] process"; "Secure our foothold in the digital industry"; "Promote greater control and influence over the digital learning ecosystem"; Provide "access to the Canvas LMS at the Unizin price"; Provide "access to tools under development, including a Learning Object Repository and Learning Analytics"; Provide "potential for cooperative relationships to 'share' digital instruction within and across the consortium". I want to pick up on University of Florida provost Joe Glover's further comment on Learning Analytics, however. The third goal for Unizin is to acquire, create, or develop learning analytics. Some of the learning management systems have a rather primitive form of learning analytics. Unizin will build on what they have, and this will go from very mechanical types of learning analytics in terms of monitoring student progress and enabling intrusive advising and tutoring; all the way up to personalized learning, which is something that really does not exist yet but is one of the objectives of Unizin. Personalized learning "really does not exist yet"? You can argue that personalized learning as a field is evolving and mostly in pilot programs, or that it is poorly defined and understood, or that there are not yet credible studies independently reviewing the efficacy of this family of approaches. But you cannot accurately say that personalized learning "really does not exist yet". And is Unizin claiming that the consortium is key to making personalized learning a reality? This seemed to be one of the arguments in the pitch. If A Tree Falls In A Different Sector . . . There are multiple examples of personalized learning in practice, particularly at community colleges to deal with developmental math challenges. I have written about the massive investment in the emporium approach at Austin Community College's ACCelerator Lab. Rather than a pilot program, which I have argued plagues higher ed and prevents diffusion of innovations, Austin CC has committed to a A) a big program up front (~700 students in the Fall 2014 inaugural semester) and ~1,000 students in Spring 2015, yet B) they offer students the choice of traditional or emporium. To me, this offers the best of both worlds in allowing a big bet that doesn’t get caught in the “purgatory of pilots” while offering student choice. We also shared through e-Literate TV an entire case study on Essex County College, showing their personalized learning approach. In another e-Literate TV case study that does not focus on developmental math, we shared the personalized learning program at Empire State College, and they have been trying various personalized approaches for more than 40 years. If A Tree Falls In A Non-Unizin Campus . . .
Personalized learning does exist, and Unizin schools could learn from the pioneers in this field. It would be wonderful if Unizin ends up helping to spread innovative teaching & learning practices within the research university community, but even there I would note that there are also some great examples in that group of schools (including at Arizona State University, UC Davis, and even at Unizin member Penn State). For that matter, the University of Florida would do well to travel two hours south and see the personalized learning programs in place at the University of Central Florida. If this "consortium of large public universities that intends to secure its niche in the evolving digital ecosystem" means that the schools want to learn primarily among themselves, then Unizin will be falling prey to the same mistake that the large MOOC providers made - ignoring the rich history of innovation in in the field and thinking they are creating something without precedent leveraging their unique insight. If A Tree Falls In A Distance Forest . . . While Unizin has never claimed to be focused only on distance education, Glover does bring bring up the topic twice as the core of his argument. Every university in some sense runs a mom & pop operation in distance learning at this point, at least in comparison with large organizations like IBM and Pearson Learning that can bring hundreds of millions of dollars to the table. No university can afford to do that. Western Governors University spends more than $240 million per year, all of which is for their online programs. While these are larger non-profit online programs, it is not accurate to say that "every university in some sense runs a mom & pop operation". It might be accurate based on the Unizin member institution experience, however. And the University of Florida did recently sign a long-term contract with Pearson Embanet to create its UF Online program, largely based on the school's inexperience (beyond some masters programs) with fully online education. In the graph below taken from the Fall 2013 IPEDS data, the Y axis is ratio of students taking exclusively DE courses (fully online programs), and the X axis is ratio of students taking some, but not all, DE courses (online courses within f2f program). 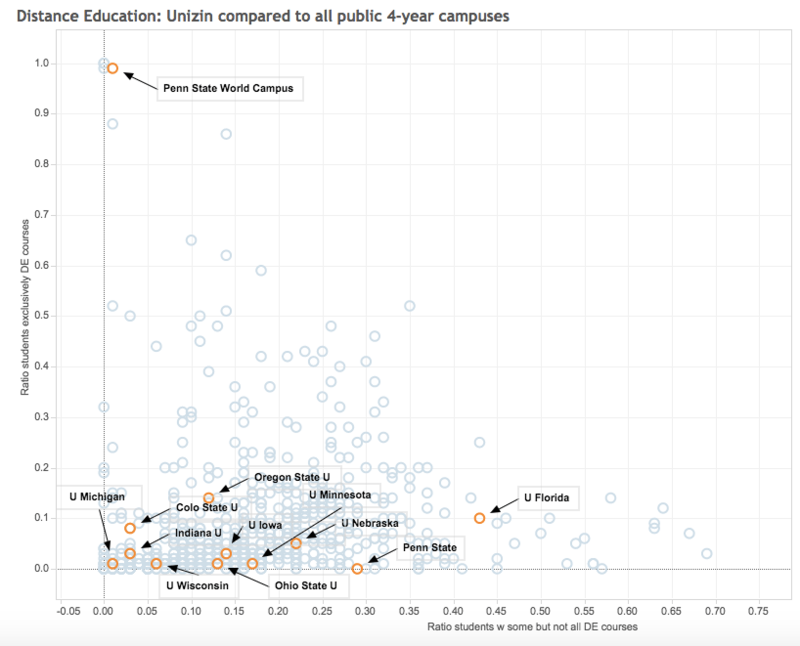 We see that the U Florida and Penn State U has fairly high percentage of students taking some online courses,Penn State World Campus is fully online (not sure if World Campus is part of Unizin or not, but I included it to be safe), and that Oregon State seems to have some fully online presence. But in general Unizin schools are not leaders in distance learning compared to other public 4-year universities. This is not a solid basis to think they have the answers on distance learning needs within the consortium. In my mind, Unizin is looking the wrong direction. The money and focus thus far has been for the 10 (now 11) member institutions to look inward - form a club, talk amongst themselves, and figure out what should happen in a digital ecosystem. A different, more useful approach would be to look outward: get the club together and look beyond their own successes (e.g. Penn State World Campus), go visit schools that are at the forefront of digital education, invite them in to present and share, and learn from others. What I'm suggesting is that Unizin should focus a lot more on participating in open communities and focus a lot less on forming an exclusive club. If the schools then set the consortium's mission as leading instructional change within the member institutions, and forming a support community based on the similar profile of schools, then we might see real results.